Calculations at a bipyramid. 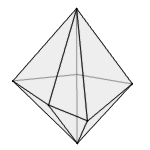 A bipyramid is a general pyramid with its mirror image attached at its base. The surface of a bipyramid is twice the surface of the original pyramid minus twice the base surface (or is the sum of the triangle surfaces). Enter two values and choose the number of decimal places. Then click Calculate. Height has a one-dimensional unit (e.g. meter), the area has this unit squared (e.g. square meter), the volume has this unit to the power of three (e.g. cubic meter).